UTF-8 is an ASCII-preserving encoding method for Unicode (ISO 10646), the Universal Character Set (UCS). The UCS encodes most of the world's writing systems in a single character set, allowing you to mix languages and scripts within a document without needing any tricks for switching character sets. This web page is encoded directly in UTF-8. As shown HERE, Columbia University's Kermit 95 terminal emulation software can display UTF-8 plain text in Windows 95, 98, ME, NT, XP, Vista, or Windows 7/8/10 when using a monospace Unicode font like Andale Mono WT J or Everson Mono Terminal, or the lesser populated Courier New, Lucida Console, or Andale Mono. C-Kermit can handle it too, if you have a Unicode display. As many languages as are representable in your font can be seen on the screen at the same time. This, however, is a Web page, which started out as a kind of stress test for UTF-8 support in Web browsers, which was spotty when this page was first created in the 1990s but which has become standard in all modern browsers. The problem now is mainly the fonts and the browser's (or font's) support for the nonzero Unicode planes (as in, e.g., the Braille and Gothic examples below). And to some extent the rendition of combining sequences, right-to-left rendition (Arabic, Hebrew), and so on. CLICK HERE for a survey of Unicode fonts for Windows. The subtitle above shows currency symbols of many lands. If they don't appear as blobs, we're off to a good start! He wes Leovenaðes sone -- liðe him be Drihten. Onfest Radestone, þer he bock radde. (The third letter in the author's name is Yogh, missing from many fonts; CLICK HERE for another Middle English sample with some explanation of letters and encoding). τὸ σπίτι φτωχικὸ στὶς ἀμμουδιὲς τοῦ Ὁμήρου. Μονάχη ἔγνοια ἡ γλῶσσα μου στὶς ἀμμουδιὲς τοῦ Ὁμήρου. ღმერთსი შემვედრე, ნუთუ კვლა დამხსნას სოფლისა შრომასა, ცეცხლს, წყალსა და მიწასა, ჰაერთა თანა მრომასა; მომცნეს ფრთენი და აღვფრინდე, მივჰხვდე მას ჩემსა ნდომასა, დღისით და ღამით ვჰხედვიდე მზისა ელვათა კრთომაასა. Sanskrit (standard transcription): kācaṃ śaknomyattum; nopahinasti mām. Classical Greek: ὕαλον ϕαγεῖν δύναμαι· τοῦτο οὔ με βλάπτει. Greek (monotonic): Μπορώ να φάω σπασμένα γυαλιά χωρίς να πάθω τίποτα. Greek (polytonic): Μπορῶ νὰ φάω σπασμένα γυαλιὰ χωρὶς νὰ πάθω τίποτα. Latin: Vitrum edere possum; mihi non nocet. Old French: Je puis mangier del voirre. Ne me nuit. French: Je peux manger du verre, ça ne me fait pas mal. Provençal / Occitan: Pòdi manjar de veire, me nafrariá pas. Québécois: J'peux manger d'la vitre, ça m'fa pas mal. Walloon: Dji pou magnî do vêre, çoula m' freut nén må. Picard: Ch'peux mingi du verre, cha m'foé mie n'ma. Kreyòl Ayisyen (Haitï): Mwen kap manje vè, li pa blese'm. Basque: Kristala jan dezaket, ez dit minik ematen. Catalan / Català: Puc menjar vidre, que no em fa mal. Spanish: Puedo comer vidrio, no me hace daño. Aragonés: Puedo minchar beire, no me'n fa mal . Galician: Eu podo xantar cristais e non cortarme. European Portuguese: Posso comer vidro, não me faz mal. Brazilian Portuguese (8): Posso comer vidro, não me machuca. Caboverdiano/Kabuverdianu (Cape Verde): M' podê cumê vidru, ca ta maguâ-m'. Papiamentu: Ami por kome glas anto e no ta hasimi daño. Italian: Posso mangiare il vetro e non mi fa male. Milanese: Sôn bôn de magnà el véder, el me fa minga mal. Roman: Me posso magna' er vetro, e nun me fa male. Napoletano: M' pozz magna' o'vetr, e nun m' fa mal. Venetian: Mi posso magnare el vetro, no'l me fa mae. Zeneise (Genovese): Pòsso mangiâ o veddro e o no me fà mâ. Sicilian: Puotsu mangiari u vitru, nun mi fa mali. Romansch (Grischun): Jau sai mangiar vaider, senza che quai fa donn a mai. Romanian: Pot să mănânc sticlă și ea nu mă rănește. Esperanto: Mi povas manĝi vitron, ĝi ne damaĝas min. Cornish: Mý a yl dybry gwéder hag éf ny wra ow ankenya. Welsh: Dw i'n gallu bwyta gwydr, 'dyw e ddim yn gwneud dolur i mi. Manx Gaelic: Foddym gee glonney agh cha jean eh gortaghey mee. Old Irish (Latin): Con·iccim ithi nglano. Ním·géna. Irish: Is féidir liom gloinne a ithe. Ní dhéanann sí dochar ar bith dom. Ulster Gaelic: Ithim-sa gloine agus ní miste damh é.
Scottish Gaelic: S urrainn dhomh gloinne ithe; cha ghoirtich i mi. Anglo-Saxon (Latin): Ic mæg glæs eotan ond hit ne hearmiað me. Middle English: Ich canne glas eten and hit hirtiþ me nouȝt. English: I can eat glass and it doesn't hurt me. Jamaican: Mi kian niam glas han i neba hot mi. Lalland Scots / Doric: Ah can eat gless, it disnae hurt us. Gothic (4): 𐌼𐌰𐌲 𐌲𐌻𐌴𐍃 𐌹̈𐍄𐌰𐌽, 𐌽𐌹 𐌼𐌹𐍃 𐍅𐌿 𐌽𐌳𐌰𐌽 𐌱𐍂𐌹𐌲𐌲𐌹𐌸. Old Norse (Latin): Ek get etið gler án þess að verða sár. Norsk / Norwegian (Nynorsk): Eg kan eta glas utan å skada meg. Norsk / Norwegian (Bokmål): Jeg kan spise glass uten å skade meg. Føroyskt / Faroese: Eg kann eta glas, skaðaleysur. Íslenska / Icelandic: Ég get etið gler án þess að meiða mig. Svenska / Swedish: Jag kan äta glas utan att skada mig. Dansk / Danish: Jeg kan spise glas, det gør ikke ondt på mig. Sønderjysk: Æ ka æe glass uhen at det go mæ naue. Frysk / Frisian: Ik kin glês ite, it docht me net sear. Nederlands / Dutch: Ik kan glas eten, het doet mĳ geen kwaad. Kirchröadsj/Bôchesserplat: Iech ken glaas èèse, mer 't deet miech jing pieng. Afrikaans: Ek kan glas eet, maar dit doen my nie skade nie. Lëtzebuergescht / Luxemburgish: Ech kan Glas iessen, daat deet mir nët wei. Deutsch / German: Ich kann Glas essen, ohne mir zu schaden. Ruhrdeutsch: Ich kann Glas verkasematuckeln, ohne dattet mich wat jucken tut. Langenfelder Platt: Isch kann Jlaas kimmeln, uuhne datt mich datt weh dääd. Lausitzer Mundart ("Lusatian"): Ich koann Gloos assn und doas dudd merr ni wii. Odenwälderisch: Iech konn glaasch voschbachteln ohne dass es mir ebbs daun doun dud. Sächsisch / Saxon: 'sch kann Glos essn, ohne dass'sch mer wehtue. Pfälzisch: Isch konn Glass fresse ohne dasses mer ebbes ausmache dud. Schwäbisch / Swabian: I kå Glas frässa, ond des macht mr nix! Deutsch (Voralberg): I ka glas eassa, ohne dass mar weh tuat. Bayrisch / Bavarian: I koh Glos esa, und es duard ma ned wei. Allemannisch: I kaun Gloos essen, es tuat ma ned weh. Schwyzerdütsch (Zürich): Ich chan Glaas ässe, das schadt mir nöd. Schwyzerdütsch (Luzern): Ech cha Glâs ässe, das schadt mer ned. Hungarian: Meg tudom enni az üveget, nem lesz tőle bajom. Suomi / Finnish: Voin syödä lasia, se ei vahingoita minua. Sami (Northern): Sáhtán borrat lása, dat ii leat bávččas. Erzian: Мон ярсан суликадо, ды зыян эйстэнзэ а ули. Northern Karelian: Mie voin syvvä lasie ta minla ei ole kipie. Southern Karelian: Minä voin syvvä st'oklua dai minule ei ole kibie. Estonian: Ma võin klaasi süüa, see ei tee mulle midagi. Latvian: Es varu ēst stiklu, tas man nekaitē. Czech: Mohu jíst sklo, neublíží mi. Slovak: Môžem jesť sklo. Nezraní ma. Polska / Polish: Mogę jeść szkło i mi nie szkodzi. Slovenian: Lahko jem steklo, ne da bi mi škodovalo. Bosnian, Croatian, Montenegrin and Serbian (Latin): Ja mogu jesti staklo, i to mi ne šteti. Bosnian, Montenegrin and Serbian (Cyrillic): Ја могу јести стакло, и то ми не штети. Macedonian: Можам да јадам стакло, а не ме штета. Russian: Я могу есть стекло, оно мне не вредит. Belarusian (Cyrillic): Я магу есці шкло, яно мне не шкодзіць. Belarusian (Lacinka): Ja mahu jeści škło, jano mne ne škodzić. Ukrainian: Я можу їсти скло, і воно мені не зашкодить. Bulgarian: Мога да ям стъкло, то не ми вреди. Georgian: მინას ვჭამ და არა მტკივა. Albanian: Unë mund të ha qelq dhe nuk më gjen gjë. Turkish: Cam yiyebilirim, bana zararı dokunmaz. Tatar: Алам да бар, пыяла, әмма бу ранит мине. Uzbek / O’zbekcha: (Roman): Men shisha yeyishim mumkin, ammo u menga zarar keltirmaydi. Uzbek / Ўзбекча (Cyrillic): Мен шиша ейишим мумкин, аммо у менга зарар келтирмайди. Marathi: मी काच खाऊ शकतो, मला ते दुखत नाही. Hindi: मैं काँच खा सकता हूँ और मुझे उससे कोई चोट नहीं पहुंचती. Malayalam: എനിക്ക് ഗ്ലാസ് തിന്നാം. അതെന്നെ വേദനിപ്പിക്കില്ല. Tamil: நான் கண்ணாடி சாப்பிடுவேன், அதனால் எனக்கு ஒரு கேடும் வராது. Sinhalese: මට වීදුරු කෑමට හැකියි. එයින් මට කිසි හානියක් සිදු නොවේ. Arabic(3): أنا قادر على أكل الزجاج و هذا لا يؤلمني. Maltese: Nista' niekol il-ħġieġ u ma jagħmilli xejn. Hebrew(3): אני יכול לאכול זכוכית וזה לא מזיק לי. Yiddish(3): איך קען עסן גלאָז און עס טוט מיר נישט װײ. Twi: Metumi awe tumpan, ɜnyɜ me hwee. Hausa (Latin): Inā iya taunar gilāshi kuma in gamā lāfiyā. Yoruba(4): Mo lè je̩ dígí, kò ní pa mí lára. Lingala: Nakokí kolíya biténi bya milungi, ekosála ngáí mabé tɛ́. (Ki)Swahili: Naweza kula bilauri na sikunyui. Malay: Saya boleh makan kaca dan ia tidak mencederakan saya. Tagalog: Kaya kong kumain nang bubog at hindi ako masaktan. Chamorro: Siña yo' chumocho krestat, ti ha na'lalamen yo'. Fijian: Au rawa ni kana iloilo, ia au sega ni vakacacani kina. Javanese: Aku isa mangan beling tanpa lara. Vietnamese (quốc ngữ): Tôi có thể ăn thủy tinh mà không hại gì. Taiwanese(6): Góa ē-tàng chia̍h po-lê, mā bē tio̍h-siong. Bislama: Mi save kakae glas, hemi no save katem mi. Hawaiian: Hiki iaʻu ke ʻai i ke aniani; ʻaʻole nō lā au e ʻeha. Marquesan: E koʻana e kai i te karahi, mea ʻā, ʻaʻe hauhau. Chinook Jargon: Naika məkmək kakshət labutay, pi weyk ukuk munk-sik nay. Navajo: Tsésǫʼ yishą́ągo bííníshghah dóó doo shił neezgai da. Nórdicg: Ljœr ye caudran créneþ ý jor cẃran. For testing purposes, some of these are repeated in a monospace font . . .
Greek: Μπορώ να φάω σπασμένα γυαλιά χωρίς να πάθω τίποτα. Polish: Mogę jeść szkło, i mi nie szkodzi. Ukrainian: Я можу їсти шкло, й воно мені не пошкодить. Hindi: मैं काँच खा सकता हूँ, मुझे उस से कोई पीडा नहीं होती. Hebrew(2): אני יכול לאכול זכוכית וזה לא מזיק לי. Yiddish(2): איך קען עסן גלאָז און עס טוט מיר נישט װײ. Arabic(2): أنا قادر على أكل الزجاج و هذا لا يؤلمني. "Ich kann Glas essen ohne mir zu schaden." "Ich kann Glas essen, ohne mir weh zu tun." (The comma fell victim to the 1996 orthographic reform, cf. http://www.ids-mannheim.de/reform/e3-1.html#P76. Schwyzerdütsch: Ich chan Glaas ässe, das tuet mir nöd weeh. In the Romanic languages, the variations on "fa male" (it) are probably wrong, whilst the variations on "hace daño" (es) and "damaĝas" (Esperanto) are probably correct; "nocet" (la) is definitely right. The northern Germanic variants of "skada" are probably right, as are the Slavic variants of "škodi/шкоди" (se); however the Slavic variants of " boli" (hv) are probably wrong, as "bolena" means "pain/ache", IIRC. > "Ich kann Glas essen ohne mir zu schaden." The latest revision (2006) of the official German orthography has revived the comma around infinitive clauses commencing with ohne, or 5 other conjunctions, or depending from a noun or from an announcing demonstrative (http://www.ids-mannheim.de/reform/regeln2006.pdf, §75). So, it's again: Ich kann Glas essen, ohne mir zu schaden. The numbering of the samples is arbitrary, done only to keep track of how many there are, and can change any time a new entry is added. The arrangement is also arbitrary but with some attempt to group related examples together. Note: All languages not listed are wanted, not just the ones that say (NEEDED). Correct right-to-left display of these languages depends on the capabilities of your browser. The period should appear on the left. In the monospace Yiddish example, the Yiddish digraphs should occupy one character cell. Yoruba: The third word is Latin letter small 'j' followed by small 'e' with U+0329, Combining Vertical Line Below. This displays correctly only if your Unicode font includes the U+0329 glyph and your browser supports combining diacritical marks. The Lingala and Indic examples also include combining sequences. Includes Unicode 3.1 (or later) characters beyond Plane 0. The Classic Mongolian example should be vertical, top-to-bottom and left-to-right. But such display is almost impossible. Also no font yet exists which provides the proper ligatures and positional variants for the characters of this script, which works somewhat like Arabic. Taiwanese is also known as Holo or Hoklo, and is related to Southern Min dialects such as Amoy. Contributed by Henry H. Tan-Tenn, who comments, "The above is the romanized version, in a script current among Taiwanese Christians since the mid-19th century. It was invented by British missionaries and saw use in hundreds of published works, mostly of a religious nature. Most Taiwanese did not know Chinese characters then, or at least not well enough to read. More to the point, though, a written standard using Chinese characters has never developed, so a significant minority of words are represented with different candidate characters, depending on one's personal preference or etymological theory. In this sentence, for example, "-tàng", "chia̍h", "mā" and "bē" are problematic using Chinese characters. "Góa" (I/me) and "po-lê" (glass) are as written in other Sinitic languages (e.g. Mandarin, Hakka)." Wagner Amaral of Pinese & Amaral Associados notes that the Brazilian Portuguese sentence for "I can eat glass" should be identical to the Portuguese one, as the word "machuca" means "inflict pain", or rather "injuries". The words "faz mal" would more correctly translate as "cause harm". Burmese: In English the first person pronoun "I" stands for both genders, male and female. In Burmese (except in the central part of Burma) kyundaw (က္ယ္ဝန္‌တော္‌) for male and kyanma (က္ယ္ဝန္‌မ) for female. Using here a fully-compliant Unicode Burmese font -- sadly one and only one Padauk Graphite font exists -- rendering using graphite engine. Unicode 4.0 or older standard did not have some medial and vowel character; the second example has them. Loosely: I am able not to hurt myself whenever I eat glass. See above about someone who knows the language, et cetera. Script trivia: the syllable ᙱ is a single unicode character representing the two elements ᓐ (syllable-final n) and ᖏ (syllable ngi). I think they just did it that way because it looks tidier than the expected ᓐᖏ. If your operating system didn't come with Euphemia (all-purpose UCAS font), you can download Pigiarniq. It comes with a jolly little inuksuk ᐀ that the Unicode Consortium is trying to make into a squatter. Norwegian: Blåbærsyltetøy ("blueberry jam", includes every extra letter used in Norwegian). Polish: Pchnąć w tę łódź jeża lub osiem skrzyń fig. Czech: Příliš žluťoučký kůň úpěl ďábelské ódy. Slovenian: Šerif bo za domačo vajo spet kuhal žgance. Spanish: Volé cigüeña que jamás cruzó París, exhibe flor de kiwi y atún. French: Les naïfs ægithales hâtifs pondant à Noël où il gèle sont sûrs d'être déçus en voyant leurs drôles d'œufs abîmés. wenn Oechtringen irgendwo mit einem Akzent auf dem O geschrieben wurde, dann kann das nur ein Fehldruck sein. 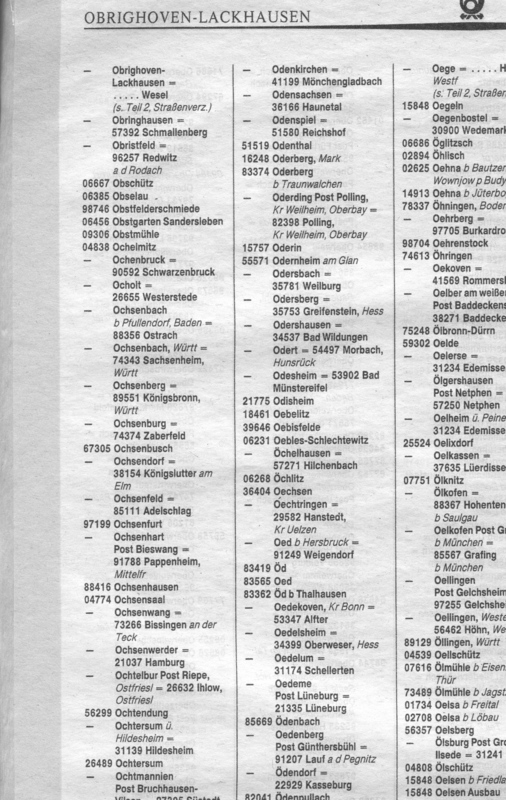 Die offizielle Schreibweise lautet jedenfalls „Oechtringen“. From Karl Pentzlin (Kochel am See, Bavaria, Germany): "This German phrase is suited for display by a Fraktur (broken letter) font. It contains: all common three-letter ligatures: ffi ffl fft and all two-letter ligatures required by the Duden for Fraktur typesetting: ch ck ff fi fl ft ll ſch ſi ſſ ſt tz (all in a manner such they are not part of a three-letter ligature), one example of f-l where German typesetting rules prohibit ligating (marked by a ZWNJ), and all German letters a...z, ä,ö,ü,ß, ſ [long s] (all in a manner such that they are not part of a two-letter Fraktur ligature)." Otto Stolz notes that "'Schloß' is now spelled 'Schloss', in contrast to 'größer' (example 4) which has kept its 'ß'. Fraktur has been banned from general use, in 1942, and long-s (ſ) has ceased to be used with Antiqua (Roman) even earlier (the latest Antiqua-ſ I have seen is from 1913, but then I am no expert, so there may well be a later instance." Later Otto confirms the latter theory, "Now I've run across a book “Deutsche Rechtschreibung” (edited by Lutz Mackensen) from 1954 (my reprint is from 1956) that has kept the Antiqua-ſ in its dictionary part (but neither in the preface nor in the appendix)." Diaeresis is not used in Iberian Portuguese. Also this pangram is missing a-tilde (ã) so it's a pænpangram. Finnish pangrams from Mikko Ristilä. In Bulgarian it is desirable, customary, or in some cases required to write accents over vowels. Unfortunately, no computer character sets contain the full repertoire of accented Cyrillic letters. With Unicode, however, it is possible to combine any Cyrillic letter with any combining accent. The appearance of the result depends on the font and the rendering engine. Here are two examples. Той видя бялата коса́ по главата и́ и ко́са на рамото и́, и ре́че да и́ рече́: "Пара́та по́ па́ри от па́рата, не ща пари́! ", но си поми́сли: "Хей, помисли́ си! А́ и́ река, а́ е скочила в тази река, която щеше да тече́, а не те́че." По пъ́тя пъту́ват кю́рди и югославя́ни. Bulgarian: [ бгдпт ] [ бгдпт ] Мога да ям стъкло и не ме боли. Russian: [ бгдпт ] [ бгдпт ] Я могу есть стекло, это мне не вредит. Serbian: [ бгдпт ] [ бгдпт ] Могу јести стакло а да ми не шкоди. The "I can eat glass" phrase and the initial collection of translations: Ethan Mollick. Transcription / conversion to UTF-8: Frank da Cruz. Albanian: Sindi Keesan. Afrikaans: Johan Fourie, Kevin Poalses. Anglo Saxon: Frank da Cruz. Arabic: Najib Tounsi. Armenian: Vaçe Kundakçı. Belarusian: Alexey Chernyak, Patricia Clausnitzer. Bengali: Somnath Purkayastha, Deepayan Sarkar. Bislama: Dan McGarry. Bosnian: Dmitrij D. Czarkoff. Braille: Frank da Cruz. Bulgarian: Sindi Keesan, Guentcho Skordev, Vladimir Marinov. Burmese: "cetanapa", Sithu Thwin. Cabo Verde Creole: Cláudio Alexandre Duarte. Catalán: Jordi Bancells. Chinese: Jack Soo, Wong Pui Lam. Chinook Jargon: David Robertson. Cornish: Chris Stephens. Croatian: Dmitrij D. Czarkoff, Marjan Baće. Czech: Stanislav Pecha, Radovan Garabík, Tomáš Malý. Danish: Morten Due Jorgensen. Dutch: Peter Gotink. Pim Blokland, Rob Daniel, Rob de Wit. Erzian: Jack Rueter. Esperanto: Franko Luin, Radovan Garabík. Estonian: Meelis Roos. Faroese: Jón Gaasedal. Farsi/Persian: Payam Elahi. Fijian: Paul Cannon. Finnish: Sampsa Toivanen, Mikko Ristilä. French: Luc Carissimo, Anne Colin du Terrail, Sean M. Burke, Theo Morelli. Galician: Laura Probaos. Georgian: Giorgi Lebanidze. German: Christoph Päper, Otto Stolz, Karl Pentzlin, David Krings, Frank da Cruz, Peter Keel (Seegras), Elias Glantschnig. Gothic: Aurélien Coudurier. Greek: Ariel Glenn, Constantine Stathopoulos, Siva Nataraja, Christos Georgiou. Hebrew: Jonathan Rosenne, Tal Barnea. Hausa: Malami Buba, Tom Gewecke. Hawaiian: na Hauʻoli Motta, Anela de Rego, Kaliko Trapp. Hindi: Shirish Kalele, Nitin Dahra. Hungarian: András Rácz, Mark Holczhammer. Icelandic: Andrés Magnússon, Sveinn Baldursson. International Phonetic Alphabet (IPA): Siva Nataraja / Vincent Ramos. Inuktitut: Louise Hope. Irish: Michael Everson, Marion Gunn, James Kass, Curtis Clark. Italian: Thomas De Bellis. Jamaican: Stephen J. Cherin. Japanese: Makoto Takahashi, Yurio Miyazawa. Kannada: Sridhar R N, Alok G. Singh. Karelian: Aleksandr Semakov. Khmer: Tola Sann. Kirchröadsj: Roger Stoffers. Kreyòl: Sean M. Burke. Korean: Jungshik Shin. Langenfelder Platt: David Krings. Lao: Tola Sann. Lëtzebuergescht: Stefaan Eeckels. Lingala: Denis Moyogo Jacquerye (Nkóta ya Kɔ́ngɔ míbalé ) (Nkóta ya Kɔ́ngɔ míbal). Lithuanian: Gediminas Grigas. Lojban: Edward Cherlin. Lusatian: Ronald Schaffhirt. Macedonian: Sindi Keesan. Malay: Zarina Mustapha. Malayalam: Anil Matthews, Bobby Jacob. Maltese: Kenneth Joseph Vella. Manx: Éanna Ó Brádaigh. Marathi: Shirish Kalele. Marquesan: Kaliko Trapp. Middle English: Frank da Cruz. Milanese: Marco Cimarosti. Mongolian: Tom Gewecke. Montenegran: Dmitrij D. Czarkoff. Napoletano: Diego Quintano. Navajo: Tom Gewecke. Nórdicg: Yẃlyan Rott. Nepali: Ujjwol Lamichhane, Rabi Tripathi. Norwegian: Herman Ranes, Håvard Kvålen. Odenwälderisch: Alexander Heß. Old Irish: Michael Everson. Old Norse: Andrés Magnússon. Papiamentu: Bianca and Denise Zanardi. Pashto: N.R. Liwal. Pfälzisch: Dr. Johannes Sander. Picard: Philippe Mennecier. Polish: Juliusz Chroboczek, Paweł Przeradowski, Wlodzislaw Kostecki. Portuguese: "Cláudio" Alexandre Duarte, Bianca and Denise Zanardi, Pedro Palhoto Matos, Wagner Amaral. Québécois: Laurent Detillieux. Roman: Pierpaolo Bernardi. Romanian: Juliusz Chroboczek, Ionel Mugurel. Romansch: Alexandre Suter. Ruhrdeutsch: "Timwi". Russian: Alexey Chernyak, Serge Nesterovitch. Sami: Anne Colin du Terrail, Luc Carissimo. Sanskrit: Siva Nataraja / Vincent Ramos. Sächsisch: André Müller. Schwäbisch: Otto Stolz. Scots: Jonathan Riddell. Serbian: Dmitrij D. Czarkoff, Sindi Keesan, Ranko Narancic, Boris Daljevic, Szilvia Csorba, O. Dag. Sinhalese: Abdul-Ahad (ASM). Slovak: G. Adam Stanislav, Radovan Garabík. Slovenian: Albert Kolar, Primož Gabrijelčič. Spanish: Aleida Morel, Laura Probaos, Ricardo Cancho Niemietz. Swahili: Ronald Schaffhirt. Swedish: Christian Rose, Bengt Larsson. Taiwanese: Henry H. Tan-Tenn. Tagalog: Jim Soliven. Tamil: Vasee Vaseeharan, Vetrivel P. Tatar: Timur. Telugu: Arjuna Rao Chavala. Tibetan: D. Germano, Tom Gewecke. Thai: Alan Wood's wife. Turkish: Vaçe Kundakçı, Tom Gewecke, Merlign Olnon. Ukrainian: Michael Zajac, Oleg Podsadny. Ulster Gaelic: Ciarán Ó Duibhín. Uzbek: Daniyar Nurgaliev. Urdu: Mustafa Ali. Vietnamese: Dixon Au, [James] Đỗ Bá Phước 杜 伯 福. Walloon: Pablo Saratxaga. Welsh: Geiriadur Prifysgol Cymru (Andrew). Yiddish: Mark David. Zeneise: Angelo Pavese. The UTF8-aware Kermit 95 terminal emulator on Windows, to a Unix host with the EMACS text editor. Kermit 95 displays UTF-8 and also allows keyboard entry of arbitrary Unicode BMP characters as 4 hex digits, as shown HERE. Hex codes for Unicode values can be found through the Unicode Consortium Character Code Charts index. When submissions arrive by email encoded in some other character set (Latin-1, Latin-2, KOI, various PC code pages, JEUC, etc), I use the TRANSLATE command of C-Kermit on a Unix host (e.g. Linux or NetBSD) to convert the character set to UTF-8 (I could also use Kermit 95 for this; it has the same TRANSLATE command). That's it -- no "Web authoring" tools, no locales, no "smart" anything. It's just plain text, nothing more. Editing in UTF-8 was rather tedious in times past but as as of about version 23 or so, EMACS handles Unicode pretty well and works well with Kermit 95 with its terminal character-set set to utf8. Subject: Je peux manger du verre, cela ne me fait pas mal. I just found out your website and it makes me feel like proposing an interpretation of the choice of this peculiar phrase. Eating glass without pain sounds like a very nice metaphor of this attempt. That is, frontiers should become glass transparent first, and be denied by incorporating them. On the reverse, it shows that through globalization, frontiers undergo a process of displacement, that is, when they are not any more speakable, they become repressed from the speech and are therefore incorporated and might become painful symptoms, as for example what happens when one tries to eat glass. The frontiers that used to separate bodies one from another tend to divide bodies from within and make them suffer.... The chosen phrase then appears as a denial of the symptom that might result from the destitution of traditional frontiers. Confusables (every silver lining has a cloud).